This Emily G's jam is a hit on goat cheese, blue cheese and try it on a baked brie. 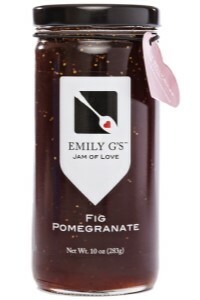 The sweet figs and pomegranate juice create a wonderful dark jam that has an earthy hint of nutmeg. Emily Myers founded Emily G’s out of a true labor of love, which through hobby and happenstance became an award winning specialty food business. A former classically trained chef, Myers produces unique combinations of savory and sweet jams. Her mission is simple – 'we do everything for the love of food'. Her jams have been praised everywhere from Bon Appetit to the Wall Street Journal and Martha Stewart Weddings. Ingredients:pure cane sugar, figs, pomegranate juice concentrate, lemon juice concentrate, pectin and spice.